The players: Laura and Lee, both 30-something Computer types. 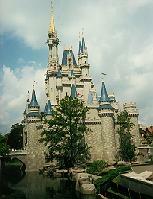 Our second trip to WDW - the first was way back in 1988. We met up with Lee's mom (Carol) and stepfather (Donn) who are retired and touring the country, living full-time in an RV. Since we live in California, flying to Florida is an all-day thing for us - we left at 7:30 a.m. and didn't arrive in Orlando until about 3:30. Claiming baggage and renting the car was uneventful, and then we were on the road. Our travel agent got us reservations at one of the many Days Inns on Highway 192 - we had stayed in a Days Inn the first time we were there (though a different one) and it was fine, so that didn't seem like a big deal. We drove past several Days Inns on 192 before finding ours...in a word, YECHHHH! It was an old two story motel (it had been a Howard Johnsons), and though attempts had been made to remodel it, it still looked very run-down and tacky. We would have immediately gone somewhere else, except that Carol and Donn were supposed to call us there to make contact, so we had to check in. We immediately called CRO to see if there were any cancellations - no such luck. Carol and Donn showed up at the motel, and the look on their faces pretty much said it all - and Lee immediately told them that we felt the same and were busily trying to find someplace else! 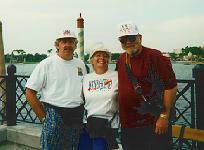 We made arrangements to meet at Epcot Center the next morning, and they left, and Lee and I headed off to get dinner and try to find someplace better to stay. We ended up at the Disney Village - tried the Marriott Courtyard (or is it Residence? ), but it was booked, so we tried the Travelodge Hotel a little further down. They could give us a reservation from Thursday (two days from then) through the remainder of our stay...so we grabbed it. We said "good riddance" to the Days Inn, got breakfast at McDonalds, and then headed into Epcot. We were early for our meeting with Carol and Donn, so we got our World Hoppers, and went into the park - our first stop was Image Works. We LOVE "playing the lights" in the music room, and we had it all to ourselves that morning. After that we rode Journey Into Imagination (Figment is adorable, though the ride is looking old.) There was no line, and the CMs were putting these stuffed bags/columns into the cars from time to time. We had to laugh, someone had stuck a pair of 3-D glasses onto the one just ahead of us. After that we went back outside and met up with Carol and Donn. They had never been to WDW before, so we got to play Tour Guide. First stop was Spaceship Earth (about 20 minutes), and then we went over to check out Honey, I Shrunk the Audience, but the line was WAY too long. So we went to The Land and did the boat tour, after about a 30 minute wait. That's always interesting. Innoventions was having a special "Technology Expo", so there were special exhibits inside Innoventions, and some outside. Therer were a couple outside that were really interesting - a big (noisy) robot arm/crane sort of thing, designed to go into hazardous areas (like nuclear reactors) and perform tasks in an environment too dangerous for humans. There was also a strange looking all-terrain vehicle (land *and* water) that was making a round-the-world tour! After that we headed over to Body Wars - Donn sat that one out, though, since he gets motion sick on things like that. About a 20 minute wait. It is kind of a rough ride - and everything zips by so fast that it's a little hard to follow. After that we did Horizons. This was one of Lee's and my favorites the last time we were here. It's also showing its age but we still enjoyed it. Universe of Energy and World of Motion were both closed. At this point we decided to walk up into World Showcase and find someplace for lunch. I should mention that we were there during Epcot's Flower and Garden Festival, and the floral displays were superb. There were flowers and topiaries everywhere. There was a neat "Lion King" display, with topiaries of Timon, Pumbaa, Nala, Simba, etc. My favorite, though, was the Beauty and the Beast topiary - they had painted or somehow dyed the leaves so that Belle was in her yellow dress, and the Beast was in his blue jacket extending the rose toward her. Very colorful, and quite lovely. We had lunch at the Lotus Blossom Cafe - the "fast food" place in the China pavilion. It's pretty good, for fast food. We then went in and wandered around the Museum while waiting for the next "Wonders of China" show. It was still really good - I love the guy who plays the poet - he's just too cool. After that we went to Norway, and stood in line for The Maelstrom - about 25 minutes. That was new to us - the Norway pavilion opened the summer after our first visit. We also toured the Stave Church. Then we walked up to The American Adventure. Lee is very patriotic and gets a bit misty-eyed over stuff like that. The bad part was that we had a bunch of high-school kids sitting in front of us, and they were taking flash photos during the show. Lee finally leaned forward and told them "No flash photography! ", and that (fortunately) subdued them and quieted them down. The Russian dancers were performing at the stage, and we caught the tail end of their show. They do some amazing things. We went over to France and viewed "Impressions de France" - I don't remember if it was there last time - it was a first for us, at least. And of course we had to have some pastries from Boulangerie Patisserie - I definitely remember *that* from our last trip! Then it was off to Canada and the "Oh Canada" film. The CMs in the queueing area were fun - at this point it was getting a little late in the day (about 6:00), and everyone was getting a little punchy. We walked back into Future World, and noticed that there was almost no line for "Honey", and it was about time for Future World to close for the day (7:00), so we hopped in line. It was pretty claustrophobic getting crowded into the hall before they let us into the pre-show area - we felt like sardines. The show was really fun. We were sitting almost in the back, and it was really weird to hear the shrieks and screams start in the front and then work their way back - and then, of course, we got *our* chance to experience what all the shrieking was about. :-) That was a neat effect. We watched the "jumping fountains" outside for a while - those are fun. At this point it was getting really cool, so we headed back to the locker where Lee had stashed our sweatshirts, since we planned to stay for Illuminations. Donn had injured his back a few days before, and he was getting pretty tired and didn't want to stay - but we told Carol we would take her back to the RV park if she wanted to see the show. We still hadn't had dinner, so we grabbed a quick meal at the Pasta Piazza Ristorante in Innoventions (pizza and pasta were adequate, but not spectacular), and then tried to find a spot for Illuminations. We finally ended up standing sort of between Canda and England, but there were trees in the way, and the viewing wasn't very good. After that we took Carol back to the RV park (they weren't staying at Fort Wilderness - too expensive), and then we had to find our own home for the night. Ended up at another motel on Highway 192 - this one not much better than the Days Inn. The exterior looks a lot better, but the room was pretty shabby - at least the Days Inn had remodeled the bathrooms and painted the rooms. Oh well, it's just for one night. Carol and Donn were taking a day off, so this was a day to play by ourselves. We set off for the Magic Kingdom, but decided to park at Epcot and take the monorail over. When we got to the TTC, about 9:00, it seemed as though everyone else had had the same idea. The line for the monorail to MK came all the way down the ramp and then some - though it got even longer after we got in it! As if we hadn't noticed before, we noticed the MK was REALLY crowded. There were kids and strollers and wheelchairs *everywhere*. And this was a Thursday, two weeks *after* everyone should have had their spring break. We finally heard that because of all the snowstorms that winter, Disney had really done an advertising blitz in the east about coming to Florida - and people had come. In droves. The Disney resorts (and the Village Resorts) were all full, and had been for weeks. Sigh. So much for "off-season". Anyway, that explains why we had pretty long waits for everything. We rode Space Mtn. next (DL is better, especially now that they have the stereo cars), though this was the first time we had seen the CNN-style "broadcast" (that's at DL now, too), and it was entertaining while we stood in line. We had a really nice lunch at Cosmic Ray's - I had the stacked sandwich - plenty of food there! We went over to Carousel of Progress - haven't done *that* in a while - it was replaced back in '76 in DL by America Sings. After that we tried out "The ExtraTerrorestrial Alien Encounter". Another long line - about 50 minutes. The pre-shows were entertaining. But when we finally got into the theater, and were about halfway through the experiences (the alien was on the loose), some kid freaked out, and his mom pushed escaped from her restraint and pushed the panic button, and suddenly things just stopped and the lights came on. The kid and his family were escorted out, and we sat for quite a while before they finally took us into the theater next door. I think it lost some of the impact after it was interrupted the first time. Even so, it's not something I care to do again. At this point we were really tired of fighting the crowds, so we took the monorail back over to Epcot. We really didn't have much time to spend there, since we were meeting Donn and Carol for dinner, and still had to check into the Travelodge Hotel, but we got some cool drinks and sat and watched the dancing fountain for a while - that's always a great way to relax. We did a little shopping before walking back out to our car. We went to the Travelodge and got checked in - got a room with a king size bed - yay! MUCH nicer than the motels we'd stayed in the last two nights. We were close enough to the Disney Village Marketplace that we decided to walk down there rather than drive, and we met up with Donn and Carol for our 5:30 reservation at Portobello Yacht Club. The meal was pretty good, though a little expensive in my opinion. After that we left Donn and Carol (having arranged to meet them at MGM Studios the next morning), and we walked down to Pleasure Island. We're not really into the nightclub scene so we walked into a couple of the clubs but didn't spend much time. Nothing much was going on in the Adventurer's Club when we were there - but we just didn't spend that much time. We watched the band at the outdoor stage for a while - they were fun (and enthusiastic!) It was very weird being at a Disney place where they were selling alcohol, though. By this time we were pretty tired, so we decided just to head back - walked through some of the shops in the Marketplace, and stopped to talk to the Disney Vacation Club guy. It sounded interesting so we gave him our name and where we were staying. Then we did the Animation Tour, which was featuring the upcoming Hunchback of Notre Dame movie, and then the Great Movie Ride. The line for that was 20-25 minutes. It was a lot of fun. By then it was time for lunch, and we grabbed something fairly quick at the Commissary, and then got in line for the Indiana Jones Stunt Show. We were pretty sure that the one guy was a plant, but still enjoyed the show. Then we headed over to the Muppet Theatre - there was a VERY long line for this - 50-60 minutes. The pre-show was fun, and how can anyone not love the muppets? At this point Donn and Carol were ready to call it a day, so they left. Lee and I walked the streets, and got a slush thing at Dinosaur Gertie's - that tasted really good (this was the warmest day we had had - high 80's). Lee wanted to do the Tower of Terror, so I walked over there with him, and then did some shopping and looking around before I walked back to wait for him. I stood at the exit for quite a while - it was fun to watch the people come out, and see the various reactions. Most people were really excited, but some of them had that wild-eyed "I'm never going to do that again" look. I didn't see any tears, though. Lee really enjoyed it. We called it quits soon after that - we just weren't interested in any of the other shows, so we caught the bus back to the Travelodge. After cooling off a little we walked over to the Marketplace and had dinner at Minnie Mia's. The pizza was ok - but we were lucky to get there when we did, because it got REALLY crowded soon after, and there was no place to sit. When we were ready to leave we offered our table to a family who immediately snapped it up. Spent the rest of the evening relaxing and reading in our hotel room. It was so wonderful to have a NICE room to come back to!!! We drove back and stopped at Crossroads and walked around some of the shops. Lee is a Wyland fan, so he enjoyed stopping at the Wyland Gallery there. Neither of us was too enthused about eating at any of the restaurants, so we got some "to go" items at Goodings, and went back to relax and eat at the hotel. We tried out the breakfast buffet at the hotel - pretty decent, $7.95 for all you can eat. The van showed up on time to drive us to our appointment at the Disney Vacation Club (DVC). This is Disney's version of a vacation timeshare - with a few Disney twists. We really liked the idea, and the homes are very nice. We also thought that it would be a good way of forcing us to plan a vacation, and maybe even go to some different places, so we ended up buying into it. The purchase was no doubt influenced by the fact that we had been so frustrated in trying to get reservations at one of the Disney resorts for this trip...so the idea of practically having a guarantee of a nice place was quite appealing. We also liked the "home away from home" aspect - neither of us is really into eating out at restaurants very much - there were a couple of nights during this trip when all I really wanted was salad and a baked potato! We're into simple breakfasts, too - cereal, yogurt, bagels, etc., so being able to have kitchen facilities was also quite attractive. Anyway, that process consumed the rest of the morning and part of the afternoon. At that point we drove back over to Epcot, and hopped the monorail over to MK. We figured it was Sunday afternoon...the crowds had to have thinned out, right? WRONG! It was still a zoo. We got in line for Splash again - the sign said an hour, but it was closer to 1:15. 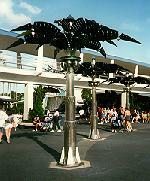 We went back over to Tomorrowland (I thought the metal palm trees were just too cool, and wanted a picture of them), but decided that was enough, and we took the monorail back to Epcot. Dinner was from the shish-kebab stand outside of Morocco and the Boulangerie Patisserie (not to mention the earlier Canadian caramel apple) - we felt quite international! We got a MUCH better spot for viewing Illuminations than we had the first time - this time we sat on one of the planters on the waterfront in front of France. We enjoyed talking to a delightful Irish family (mom, dad, and three pre-teen boys) who now live in Canada. After the crowds thinned out a little we walked towards the front, but stopped to watch the fountain dance for a while. It's even prettier at night, with all of the colored lights. We drove our own car over to Blizzard Beach. Blizzard Beach is a water park - the "legend" is that there was a freak snow storm in central Florida, and a ski area sprung up around it. When the snow melted, they were left with all of this water - but still had the ski lodge facilities. So you still have a "ski lift" and slalom courses and ski jumps - but now they're on water instead of snow. It's really very clever and very well-themed. After getting a locker and stashing our towels, etc., on a couple of the lounges we rode up the "ski lift". Fools that we are, we decided to get our feet wet by doing "Summit Plummet" first thing. The line was long - probably 25 minutes. Whew, it is *definitely* a thrilling ride! You climb to the very top of Mt. Gushmore, and when you get in position at the top, they tell you to cross your ankles, cross your arms (each hand on the opposite shoulder) and then lay down. You hydroplane almost straight down on about 2" of water...and reach a speed of about 60 mph. After that we headed over to "Runoff Rapids", which are water flumes that spiral down the mountain - you ride down in an innertube. We rode those several times - the enclosed version was my favorite, though it made Lee a little claustrophobic. Then we waited for rafts so that we could try out "Snow Stormers", which is a "slalom course" that you do on a raft shaped like a tobbagan - laying on your stomach. Fun, but we decided the "Rapids" were better. We tried the "Slush Gusher", which is another water slide, though not as steep or exciting as Summit Plummet. Then we went back to the Rapids again for a couple of runs. The lines were much shorter (5 minutes) for the innertube and raft rides than for the water slides. We were waterlogged enough by then, so we changed clothes and had a late lunch at Lottawotta Lodge. For a counter service place the food was quite good. We drove over to the Ft. Wilderness area to check out River Country and take the boat over to Discovery Island. River Country is another water park that's over there - but it didn't really appeal to us - though there were lots of kids having fun, and it didn't seem as crowded as BB. Discovery Island is a wildlife preserve in the middle of the lake, with lots of different reptiles, birds, monkeys - and quite a few Galapagos Tortoises! It was a bit of a disappointment - but, then, we have been spoiled by the San Diego Zoo. Still, the shows were interesting. After dinner we drove back to the RV park and said our good byes. That it's our last day at WDW is bad enough, but does it have to be raining, too??? We woke up to a steady downpour, and it continued. We packed, decided that we didn't want to use the last theme park day on our passes to go in the rain (and we would have to leave by 1:30 anyway, to drive to the airport), so we decided that since it was wet, why not try Typhoon Lagoon? Good idea, but all the water parks were closed because of the rain. We had checked out of our hotel, so no longer had a "home". We went over to Old Key West and checked it out a little more, but then decided to go have lunch at one of the restaurants in Crossroads. It was still raining. By the time we got out of the restaurant it was letting up, and by the time we got to the airport the sky was clearing - and the sky was mostly blue when the plane took off. We arrived home after an uneventful trip. Text and photographs copyright © 1996, by Laura Gilbreath. Feel free to link to this document, but you may not redistribute it in any form without the express written consent of the copyright holder.